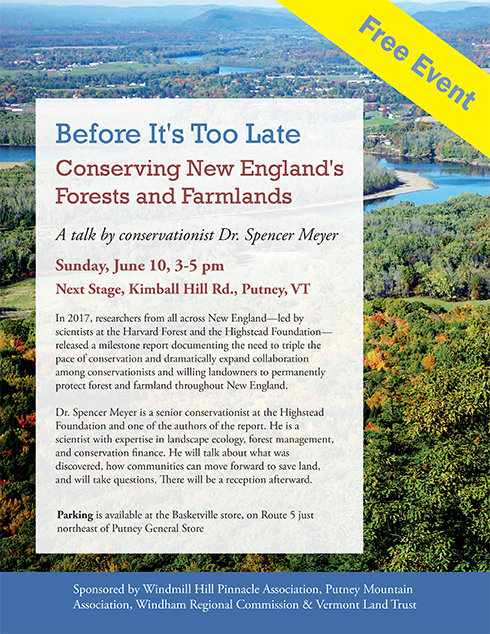 Dr. Spencer Meyer, a Senior Conservationist at the Highstead Foundation, will discuss the 2017 Harvard Forest “Wildlands and Woodlands” report: its discoveries, vision, and recommendations. This recently released report, initiated by scientists at the Harvard Forest – Harvard University’s 4,000-acre ecological classroom and laboratory – with input from conservationists, academics, and scientists at the Highstead Foundation and the New England Forestry Foundation, explains the need to triple the pace for collaboration among conservationists and willing landowners to permanently protect both forest and farmlands throughout New England. The introduction to the report states that the aim is to “permanently protect by 2060 at least 70 percent of the New England landscape as forests, along with another 7 percent that is currently in agriculture – intact and in use for both nature and people.” Thorough a balanced approach to conservation and preservation, education, translation into public policy, and consensus building for support, “most land would be actively and sustainably managed for wood, food, and other values while continuing to deliver clean water and air, wildlife habitat, recreation, and support for human lives in a changing environment.” How to achieve those desirable results is the great challenge. This important free program is sponsored by the Putney Mountain Association, Vermont Land Trust, Windham Regional Commission, and Windmill Hill Pinnacle Association. The discussion, with a question-and-answer session, followed by a reception, will take place at Next Stage, 15 Kimball Hill Road, Putney, Vermont. Parking is available at the Basketville store on Route 5, just northeast of the Putney General Store.